Final version 2009 King County Natural Color orthoimagery acquired by Pictometry for internal business and agency use only. 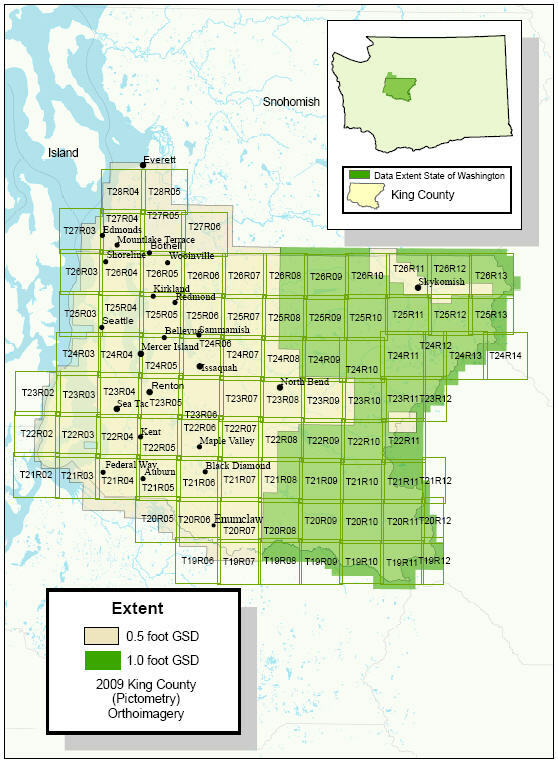 Pixel resolution is 1.0 foot GSD in rural (east) King County and 0.5 foot GSD in urbanized (west) King County. Higher resolution data includes portion of southwestern Snohomish County, the Highway 2 corridor in northeast King County and the Apenal area near Snoqualmie Pass. The 1.0 foot data is also known as Neighborhood-level imagery whereas the 0.5 foot data is known as Community-level imagery. The orthoimagery described in this metadata will be delivered in King Countys standard township-range tiling scheme and can be viewed with existing GIS and image viewing software. 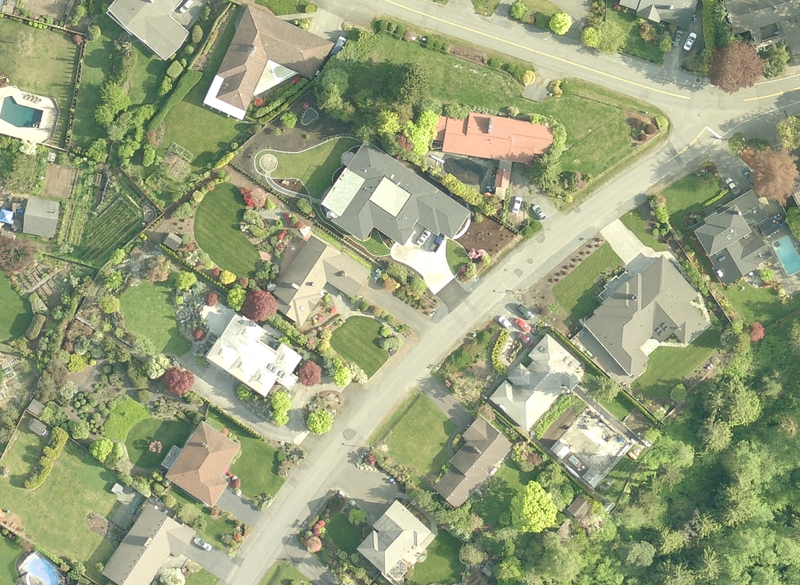 The proprietary package of oblique/vertical imagery from Pictometry is viewable only through their ArcGIS 9.x extension and their stand-alone EFS software. Though the imagery is stored in native resolution (both 0.5 foot and 1.0 foot) in Plibrary3, ArcGIS LYR files are standardized to a naming convention of txxryy_07n050.lyr, even for areas where the GSD of the native imagery is 1 foot. Orthoimage tiles are composites of individual images and have undergone reprocessing. As such the date stamp on the sector tiles or their derivatives is not correct. To correctly determine the acquistion date and time for an area you need to use the spatial indexes found in plibrary3/reference/indexes/Pictometry09. Pictometry (under contract with King County), 200911, 2009 King County (Pictometry) Orthoimagery - 6 in (west) and 1 ft (east): King County, King County; WA. Image data was imported into separate SDE raster feature dataset mosaics (GISPROD.Raster). REG_09NAT_050 contains the portion of the project at 0.5 foot (6 inch) resolution and REG_09NAT_100 contains the portion of the project at 1.0 foot resolution. Township-Range tiles in SID format were created using MrSid V7 at 15x compression. Both the township tiles and the 7500 tiles were created directly from the sector tile TIFF data using MrSid V7 software. The only difference between the 7500 tiles and the Township tiles is that the 7500 tiles are SID format compressed losslessly while the township tiles are SID format at 15x compression. Even though the difference in quality and resolution between the 7500 tiles and township tiles is almost negligable, the 7500 tiles should represent a more true representation of the original TIFF image quality and resolution. Having the 7500 tiles also provides a smaller file (200 mb vs 900 mb) than the township tile when only a smaller area is required. Finally, the 7500 sid tiles can be successfully converted to TIFF using the GP Copy Raster tool. All 7500 SID tiles were inspected for QC. Snow and Smears were identified, digitized, and coded. The snow and smears were then unioned with Pictometry's index to identify which Pictometry tile was defective: J:\OrthoMaint\Pictometry7500FinalFromSector\idxpsect09_errors.shp. This will be sent to Pictometry for QC inspection. One-hundred twenty-seven (127) ground control points, provided by KC Road Services and the City of Seattle, were identified on the imagery. X-Y coordinate points were collected and X and Y offset (Photo - Ground Control) and RMS analysis was performed. A spreadsheet of the tabular information can be found at <http://www5.kingcounty.gov/sdc/raster/ortho/photo_control_master_09n050_RMSError.xls>. Overall RMS (root-mean square error) is calculated as 3.27 feet (X) and 1.44 (Y). Tiles were created for all standard township-range tiles. The full extent of the project area imagery extends beyond the tile bounds in some areas. The SDE mosaic, Zone and KeyRegion mosaics were created from all available data. West county (Neigborhood) imagery was generally acquired during April and May, while the east county (Community) imagery was acquired from August through October to ensure snow-free conditions. The date of each image is part of the image (oblique or vertical) file itself. The set of integers just before the file-type suffix (such as 090814) refers to standard form 20090814 or August 14 2009. Be aware the the Sector tiles (part of the Pictometry image library) are created from the underlying vertical (ortho) components. The dates associated with the images, either in their indexes, or in the file names themselves, refers to this post-acquisition construction date. Do not use these dates as an indicator of the image acquisition. Alternatively, to correctly determine the acquistion date and time for an area you need to use the spatial indexes found in plibrary3/reference/indexes/Pictometry09. Imagery was captured over a span of five months in a block-type pattern, with infill areas. This less-than-optimal flight pattern resulted in noticeable temporal/vegetative variations in the mosaic tiles. Somr tonal variation is also evident across many of the tiles due to variations in lighting conditions.